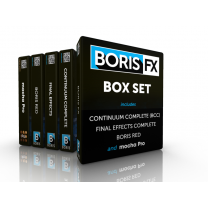 This Boris Box Set Avid Option includes RED; Boris Continuum Complete (Avid, Adobe/Apple/OFX); Final Effects Complete (Adobe/Apple) & Mocha Pro (Multi-Host). 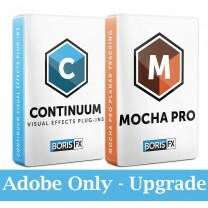 This Boris Box Set Upgrade Avid Option includes RED; Boris Continuum Complete (Avid, Adobe/Apple/OFX); Final Effects Complete (Adobe/Apple) & Mocha Pro (Multi-Host). Includes both Continuum 2019 - the world's most complete plug-in toolkit - and Mocha Pro 2019 plug-in - Academy Award-winning planar tracking & masking software. This is for Adobe only. This Legacy Renewal is for Continuum 2019: The world's most complete plug-in toolkit and Mocha Pro 2019 plug-in: Academy Award-winning planar tracking & masking software. 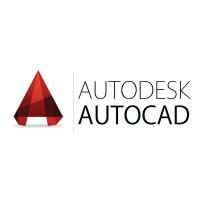 This is for Adobe After Effects & Premiere Pro. 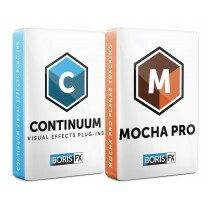 This Annual Subscription is for Continuum 2019: The world's most complete plug-in toolkit and Mocha Pro 2019 plug-in: Academy Award-winning planar tracking & masking software. This is for Adobe After Effects & Premiere Pro and OFX hosts, The Foundry's NUKE, Resolve, VEGAS Pro, and Quantel. This Legacy Renewal is for Continuum 2019: The world's most complete plug-in toolkit and Mocha Pro 2019 plug-in: Academy Award-winning planar tracking & masking software. 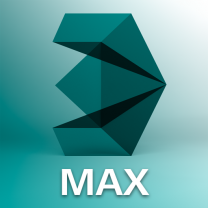 This is for Adobe After Effects & Premiere Pro and OFX hosts, The Foundry's NUKE, Resolve, VEGAS Pro, and Quantel.